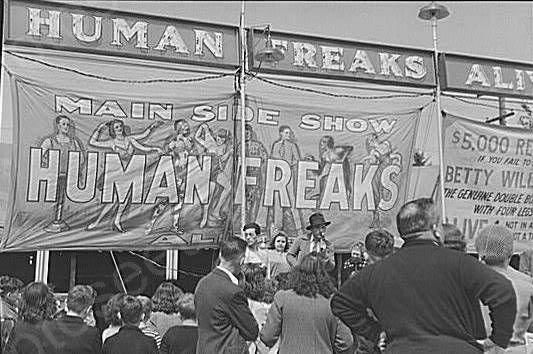 Sideshow freaks and other extreme attractions were a big part of circus sideshows, carnivals and county fairs, but sideshows also had their aggressive, yet colorful, sideshow pitchmen, also known as “talkers”. These talkers could also be found working the five-and-dimes and the boardwalks across the United States with their hard-selling, flamboyant style of marketing. 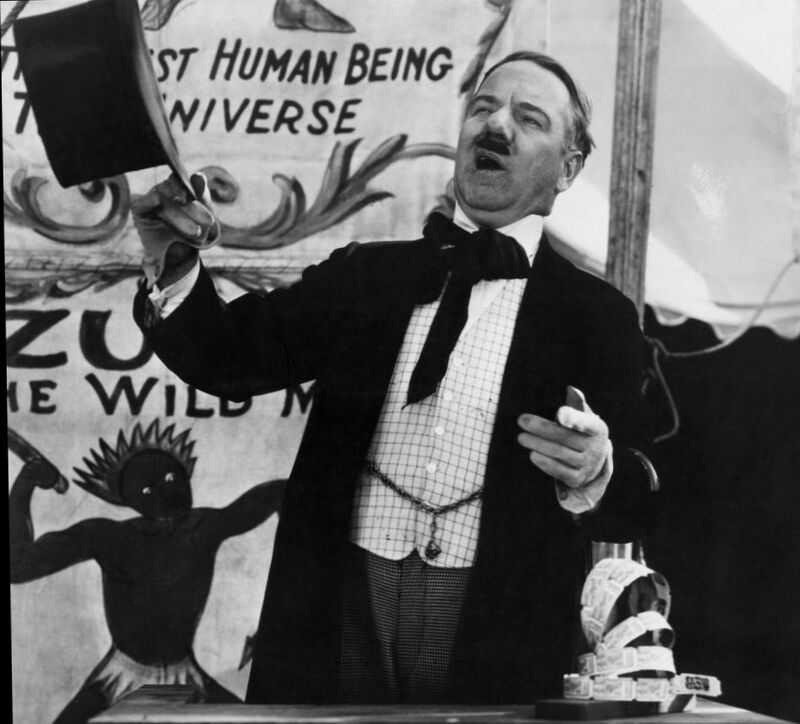 The sideshow pitchman was both an entertainer and a salesman, who captured the imagination of his audience with stories that were bigger-than-life, yet believable. The sideshow pitchman always exhibited the mark of a true showman, as he would first make his audience applaud and then take their money. The sideshow pitchman never used one word when four would suffice. As the sideshow pitchman ballyed his sideshow attraction with his distinctive brand of hyperbole and conspicuous use of superlatives, the audience, like a moth drawn to a light, was captivated by his enchanted narratives and soon cheerfully paid to see the sideshow freaks or other attractions that he offered them. However, the colorful words and exaggerations were not the only ingredients needed to create a successful sideshow pitchman. There was a structure to the sideshow pitch that allowed it to work so well. The first step was called “building the tip”. The “tip” was the sideshow term for the crowd that would gather in front of an attraction to hear the sideshow pitchman. A free show of some sort was given outside a sideshow to attract a tip. 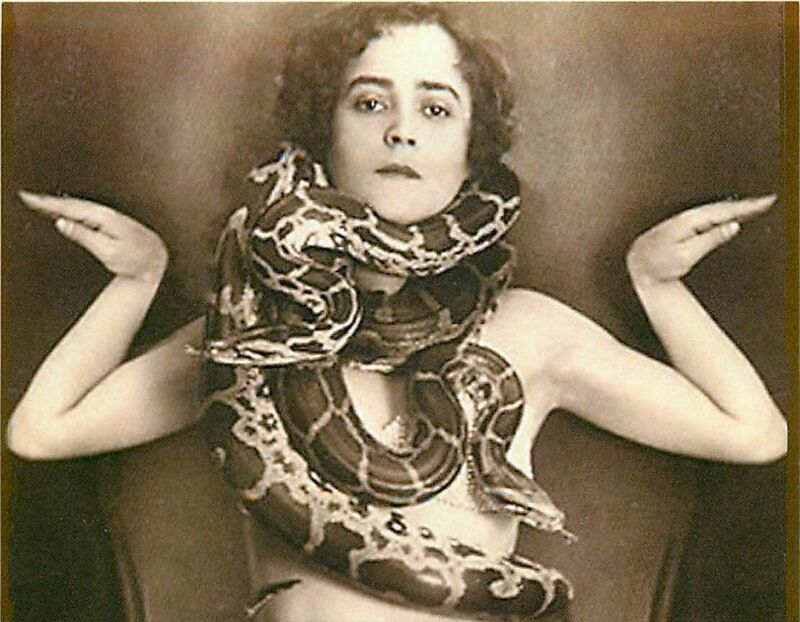 In the daytime, a beautiful girl in a revealing costume, often holding a big snake, was often used to build the tip. 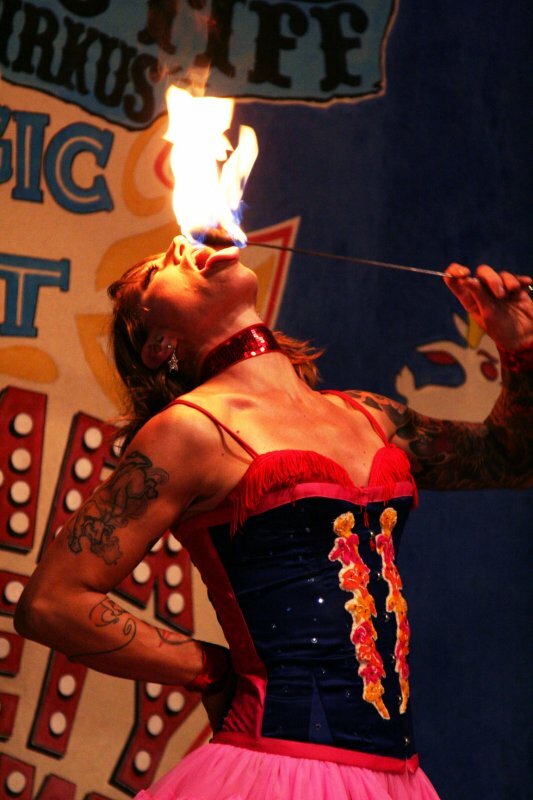 At night time, a fire-eater or fire juggler was used very successfully to build a tip. An extreme sideshow freak, such as a pinhead, or magic tricks were other draws that were often used to bring the crowd to the sideshow pitchman. "Making the opening" was a term referring to attracting the attention of everyone within earshot. The object was to assemble a crowd, anyone willing to pause for a moment to find out what all the excitement is about. Once, the sideshow pitchman had built a tip, he now had to “freeze the tip”, the second step in a successful sideshow sales process. This phrase refers to holding the audience in place so that the talker can sell them. If you can get a few people, successfully mesmerized, this will in turn attract a larger crowd, as other people wonder “What are all those people looking at?” and decide to check it out. Sometimes a “stick” or shill was also used to subtly herd the tip into a tightly-packed bunch making it more difficult for anyone to leave the tip and much easier for them to stay to see the “draw”, something interesting that was designed to draw the tip closer to the bally platform. This was sometimes done with a real magic trick, or even just the illusion that a magic trick was going to be performed. For example, the sideshow pitchman might say that he is going to do a magic trick, put a dollar bill in his lapel, while telling the audience to watch the dollar bill. He may interrupt his bally several times to say “watch the dollar bill”, but never actually perform a magic trick. Another clever method was to tell the audience that it was important to keep their eyes on the coin that the pitchman would place under a beautiful girl’s shoe. He would tell the audience that by the end of the show the coin will have moved to her hand. But at the end of the show, the girl would simply pick up the coin and place it in her own hand. These clever devices, while simple, would hold the audience, who waited in anticipation of the magic trick, while the sideshow pitchman delivered his bally. The bally was the third step of the process. Now that the pitchman has successfully frozen the tip, it is his job to sell them on the entertainment that is on the inside. He does that with his bally, short for “ballyhoo”. The bally was a five to six minute commercial, sometimes illustrated with quick appearances by the sideshow freaks featured in the show. The term ballyhoo is defined by the Merriam-Webster dictionary as “a noisy attention-getting demonstration or talk.” The term’s origin has been the subject of much speculation. Some have said that the term originated at the 1893 Columbian Exposition, where Beledi dancers from the Middle East were called by Exhibit manager W.O. Taylor during slack periods to perform outside in order to attract crowds. These tired performers, who only spoke Arabic would mutter “D’Allah hun”, which can be translated as “Oh, for God’s sake!”, as they were forced to perform these additional duties. Taylor who did not speak Arabic and supposedly heard “D’Allah hun” as “ballyhoo” began calling these performers to ballyhoo. Some also credit Taylor’s corruption of the name “Beledi dancers” as the origin of the term “belly dancers”. However, the origin of this term is generally credited to Sol Bloom, the entertainment director of the 1893 Columbian Exposition, who referred to the dance as “danse du ventre,” which literally translates as “belly dance”. The word ballyhoo, first recorded in 1836, was a nautical slang term used to describe an inferior ship. This usage was thought to be related to the word ballahou, from Spanish balahú, which was a type of small schooner. However the connection between these sailing terms and its use by the sideshow pitchman has never been clearly established. An article published in the July 1880 Harper’s magazine refers to a ballyhoo bird, but again no clear connection has been established between this bird and the word’s usage in the sideshow. The success of the sideshow was highly depend upon the quality of its pitchmen. It has been said that the most expensive thing that promoter could have at a sideshow is an inexperienced or lazy pitchman. The best sideshow pitchmen worked for a percentage of the gross ticket sales. This created the necessary incentive for them to work hard even when they were tired. However, because of the extreme physical and emotional energy required to perform well, several sideshow pitchmen were often used, sometimes working one hour and then resting two. As the sideshow pitchman brings his bally to its climax, he must “turn the tip”, getting the crowd to buy tickets to see the show. When the crowd starts to line up to buy tickets, the pitchman has turned the tip, the fourth step in his sales process. If the pitchman turned the entire tip, it was said that he “cleaned the midway”. During the active ticket-buying phase, the pitchman has stopped his bally and begins to “grind”, the fifth step in the sales process. The sideshow pitchman grinds with compelling and rhythmic phrases, like “Hurry, hurry, hurry! Don’t miss a moment of it! Hurry, hurry, hurry! See it all if you are quick enough to get in line. Hurry, hurry, hurry! Follow your neighbors. They know where they are going. They are going inside. They are going to see the freaks! Hurry, hurry, hurry!” The grind is intended to keep up the excitement and to move the audience into the show. A “grind show” is a show or attraction where the audience can walk through and see it at any time without being guided. These shows have no pitchman with their bally and no clear beginning or end time. In the past, grind shows had “grind men”, ticket sellers, who would just grind away all day. This was considered a less-skilled job than sideshow pitchman, because the grind is much less complex and interactive than the pitchman’s bally. Most of the shows on today’s carnival midway are grind shows; however, the grind men have been replaced by audiotapes that play over the sound system. The final step is the “blowoff”, sometimes called “the blow”. This is where the real money could be made, because the sideshow exhibitor did not have to split this “inside money” with the front office. It was also one of the sources for the sideshow’s dark reputation. At the end of the show, there was a final “surprise” sales pitch, where the crowd was offered a really extra special added attraction for an additional fee. Members of the audience could either pay to see this special attraction, or they could “blow off” and leave without seeing it. It was at this point that the pitchman would suddenly slow his pace to draw attention by contrast and tell a story. The pitchman might say, “I want to draw your attention to a special attraction not advertised on the outside. To give you a full appreciation of what you are about to see, let me tell you a brief story.” This is where the pitchman would really showcase his story-telling abilities. What was behind the curtain could have been anything, but almost certainly it was not alive. 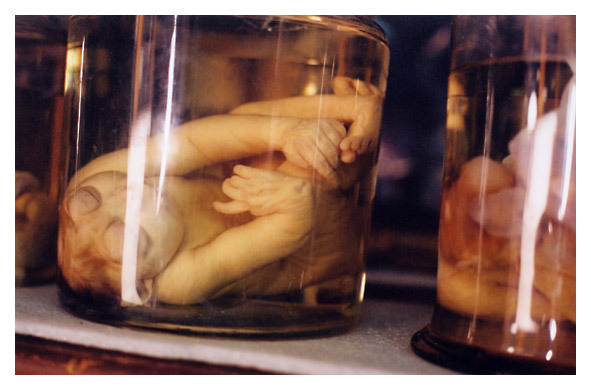 Often there was what was called a “pickled punk,” a deformed fetus in a jar of formaldehyde. Sometimes there was a “fake” freak, something made out of the parts of dead animals. But usually the build-up was far greater than whatever you saw. Sometimes these special attractions were only aimed at men. In these cases, a magician might do a brief magic show for the ladies and children on a platform at the far end, while the men who paid the extra fee could go behind the curtain to see the blowoff. Again this special attraction could be almost anything. Perhaps a chance to come up on stage and look down into the Blade Box, where the young lady inside is presumed to be naked. 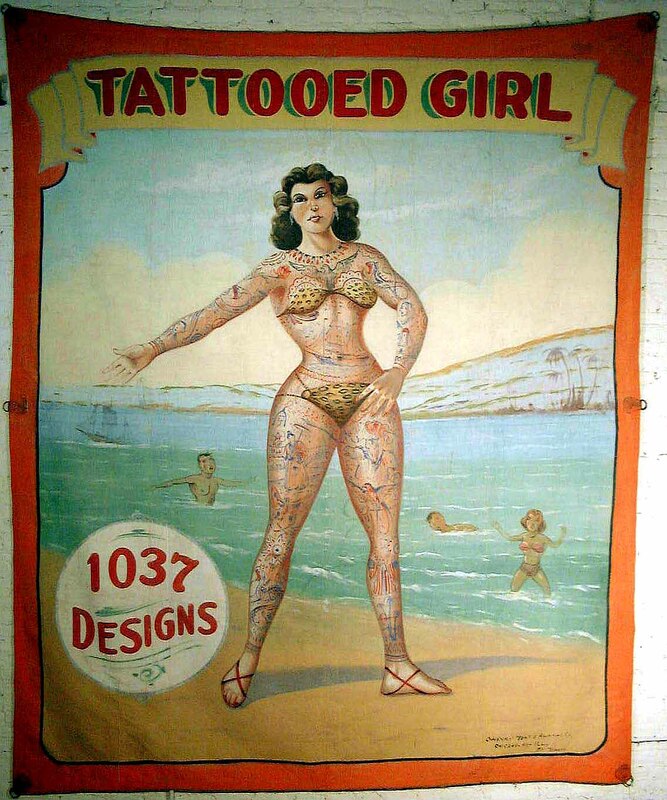 Perhaps it would be the chance to buy a sideshow item “for men only,” or to see a part of the tattooed lady’s anatomy that might not be appropriate to show women and children. And again the build-up was usually far greater than whatever you actually saw. There are still pitchman working at carnivals and fairs; however, most are pitching some kind of product rather than sideshow freaks. Some have actual gone into television where they make good money doing infomercials with only a fraction of the work. One of the most famous modern pitchman was S. David Walker. Walker, now dead, worked the Svengali cards on midways and sideshows for decades. 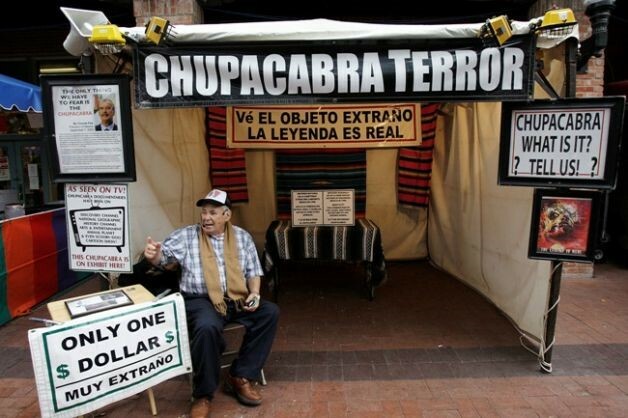 When he could not work cards in his later years, he found the Chupacobra, and displayed that for many years (see photo above). Walker is known as one of the best Svengali pitchman ever. Walker was taught the Svengali Card Pitch by its inventor, Mickey McDougall. Walker later taught famous pitchman, Don Driver, who himself continued to pitched Svengalis for over a quarter of a century. Don Driver started his magic career in the late 1960’s working at the Yogi Magic Mart in Baltimore Maryland, his home town. From there Driver moved to sideshows and later he was inducted by David Walker to become a Svengali pitchman. Don worked as pitchman for more than 30 years and is considered the best Svengali pitchman alive today. Svengalis are card decks that have been special altered to make performing magic tricks much earlier for the novice. These were invented by magician, Burling Hull, who was also known as “Volta the Great”, “The White Wizard,” and “The Man with the Radar Mind”. Hull patented the Svengali deck of cards in 1909. Today, Svengalis are usually bought from magic dealers or pitchman at carnivals and fairs. Modern day pitch man have their own set of tricks that allow them to prosper, if they are good at the game. For example, if you have a crowd of fifty and from this twenty-five people come forward to buy, the great pitchman will only sell to twenty of them. To the other five, he says, “Wait! There’s something more I have to show you!” Then he starts his pitch again, with some different variations, and the remaining four or five become the inner core of his next crowd. Hemmed in by the people around them, and eager to pay their money and be on their way, these five will start the selling frenzy all over again in the new crowd. You also have to know how to ask for the money. One way is to use “the countdown”, in this routine the pitchman says, “You’re not going to spend three hundred dollars, not a two hundred and eighty dollars, not two-seventy, not two- sixty . . . etc.” It’s a modern pitchman’s trick. By starting the price way up high it creates more drama and excitement in the sale. Another cardinal rule of the modern day pitchman is that flash will bring you the cash so you want to always be showing the crowd something that wows them.